So I'm on this fabric shopping binge right now. I'm collecting as I have high hopes to make big bed quilts for my kidlets this year. Just remind me about that occasionally, okay? I may need a kick in the pants to keep focus. Recently I purchased some Forests Friends by Amy Schimler. I love the whimsical prints that Amy has designed and they will totally rock the boys nature themed room. Check out this cool idea with her fabric. c) if I could find the fabric in a local store it would be about 4 times the cost of online. e) packages are so much fun to get in the mail, even if you are paying for them yourself. Now you know my motivations I'll tell you the only con to ordering online. Trying to order solid color fabric is a pain. The colors on my monitor never give me a great indication of what the color will be like in my hot little hands. It's always a risky and takes me forever to make a decision guess. When I put my last fabric order in for the Amy Schimler prints, I decided to take matters into my own hands. I ordered the Robert Kaufman Kona Cotton solids color pallet. 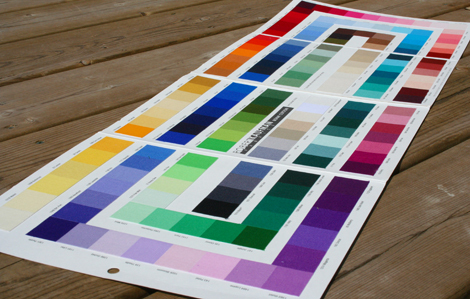 169 delicious colors to choose from, maybe even too many colors if you know what I mean. Internet shopping will never be easier, or maybe that is a really bad thing? What do you think? i LOVE those prints, i was eyeballing them the other day... yummy. miss you guys! when are we getting together??? i was thinking about doing the same exact thing for solids...ordering a color card. it would save a ton of money over the long run, i'm sure of it! take less time in choosing. I love your collection, and I can just say that the color palette you have there is a dangerous thing. I speak from experience. 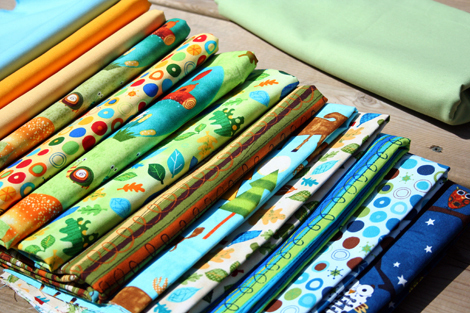 The good news is that the solids are less expensive than prints and the fabric is fabulous! for Kona solids...gotta have variety, right? is the bill that follows ;) Oh why can't money grow on trees?